Passover is a holiday filled with tradition. Families gather, familiar recipes are brought out from generation’s old cookbooks, and family favorites are brought alive in the kitchen. I remember learning how to make some Passover “classics” and was reading a recipe for matzoh balls and when I asked about chicken fat, I was told that no one does that anymore, “we use vegetable oil.” The problem with that is that the vegetable oil for Passover is cottonseed oil. Not only does cottonseed oil not taste delicious, but it is not good for you. Cottonseed oil may contain natural toxins and probably has unacceptably high levels of pesticide residues (cotton is not classified as a food crop, and farmers use many agrichemicals when growing it). Furthermore, cottonseed oil is too high in saturated fat and too low in monounsaturated fat. This year for Passover, I am reclaiming an old Jewish tradition, one that is tasty, healthy and so greatly misunderstood. This year for Passover, I am going to use some delicious, savory chicken and duck fat for my dishes. Sure, I will still use my trusty extra virgin olive oils, but the holiday is all about tradition, and this is one tradition I am going to enjoy. The 12th-century rabbi and physician Maimonides touted the benefits of chicken soup to one's health. Many other cultures also believe in the restorative properties of chicken soup and it turns out that it indeed may be good for you. Poultry fat has monounsaturated fatty acid palmitoleic acid which boosts our immune system. Chicken fat has the most of this healthful fat and what has instinctively been understood by many cultures around the world can now be backed up by science. There is something magical about the golden pools of chicken fat. Animal fats contain fatty acids with help our bodies fight disease; help absorb vitamins and lower cholesterol. The human body can burn the short-chained fatty acids found in animal fats and will simply store the long-chained ones found in polyunsaturated fat. When I teach and lecture, I talk about how the human body can process natural fats but cannot tolerate hydrogenated and processed fats. Some states outlaw the use of trans fats and many companies have voluntarily stopped using them in production of their products. I have often said that margarine will be the dietary ruin of the Jewish people. Once touted as a healthier fat and as a substitute for butter, margarine and other processed fats are known to be unhealthy. It is a myth that eating animal fat makes you fat. In the United States, 315 of every 100,000 middle-aged men die of heart attacks each year. In France the rate is 145 per 100,000. However, In the Gascony region, where goose and duck liver form a staple of the diet, this rate is only 80 per 100,000. This phenomenon has recently gained international attention as the French Paradox—they eat more poultry fat in Gascony than anyplace else, but they live the longest. The average American cook purchases their poultry precut on Styrofoam boards wrapped in plastic. We are out of touch with our food. We do not know how to cut it and we pay more than twice as much as we should. Think about it. The butcher/producer bought the whole chicken and paid for it by the pound. You purchase pieces of the bird (boneless, skinless breasts, thighs, legs or wings) but pay based on the weight of the entire bird. You might as well buy the entire bird and learn to use it from top to bottom. As a consumer you will come out ahead when you learn to utilize the entire bird. In my home and professional kitchens, I use the pieces of chicken for meals, the carcass for stocks and the fat for EVERYTHING! Ashkenazi Jews have a long history with schmaltz. Instead of butter and in the absence of olive oil, European Jews turned to schmaltz as their cooking fat. In America when in 1933, Procter and Gamble published “Crisco Recipes for the Jewish Housewife,” a promotional cookbook available in English and Yiddish, animal fats lost favor as immigrants strove to assimilate. Jewish households never looked back as medical journals wrongly accused animal fats as being unhealthy and touted hydrogenated fats such as Crisco and margarine. Start with a whole chicken or duck. The challenge with kosher duck is that it is always found frozen and whole. This requires a bit of planning ahead and a fearless plan of attack. Cutting duck or chicken is not hard, but like many kitchen skills has been replaced with purchasing cut up pieces. I love cutting duck and chicken and want you to as well—so grab your sharpest knife, thaw your birds, and steel yourself. Here we go. Place the duck or chicken breast side up on a cutting board with the legs facing you. (The breast side is plumper than the backside). Locate the breastbone that runs down the center of the bird. Cut a line as close to the breastbone as possible down the entire length of the bird. Gently scrape your knife along the body, this loosens the meat without cutting into it. Follow downward with your knife until the entire breast is cut away from the bone. To remove the legs and thigh: cut the piece of skin that attaches the leg to the bones. Bend the leg slightly to loosen it from the joint. Cut the skin on the back and remove the leg and thigh. Trim any pieces of fat and loose skin from the chicken or duck. I individually wrap my poultry pieces and then freeze them. I save my carcasses for stock and the fat for rendering. Place the fat in a saucepan. Add about ⅓ cup water for 1 pound of fat/skin. Place the pan on very low heat and let the fat melt very gently. The water will evaporate and pieces of skin will start to turn golden brown. This process can take several hours. You can do this in a very low oven at 275 F.
When the skin turns golden brown, pour the fat and skin through a strainer. Press on the skin to get every last drop of fat. Cool the fat before storing. And see below for Gribenes/Cracklings. Return the skin to the pan and turn the heat to medium. Add one medium white onion that has been diced. Continue cooking, occasionally pouring off the fat and saving it, until the skin turns a deep brown and is very crispy. I have never really liked the standard potato-leek soup so popular in the late winter and early spring. The soup just doesn’t have any OOMPH! My roasted version with the addition of parsnips, roasted garlic, and generous sprinkle of gribenes with the caramelized potatoes and leeks has punch and flavor. The soup is addicting with a decadent creamy consistency. 1. Place the onion, leek, potatoes and parsnips on a parchment lined sheet pan. Toss the vegetables with the poultry fat and roast in the preheated oven until they are medium brown and caramelized (about 20-30 minutes). 2. Transfer the vegetables to a saucepan with the garlic and remaining ingredients. Simmer over low heat until the vegetables are very soft (about 20 minutes). 3. Puree with soup with an immersion blender. Adjust seasoning with kosher salt and freshly cracked pepper. 4. Serve the soup garnished with fresh chives and gribenes. Duck confit is like kitchen gold. The ancient method of preserving poultry in fat is not hard, but does take a bit of time. Confiting is the technique of poaching duck legs and thighs in their own fat. The gentle heat transfer ensures that the meat will retain moisture and flavor. Poaching poultry in water is not the same. The fat molecules are too large to penetrate which is not the case with water. The water actually dries out the meat, whereas the fat keeps the meat juicy. The meat is then stored in the fat where it attains even more flavor and can be preserved for as long as 6 months. Once made, the confit can be served as a garnish, salad, entrée, or appetizer. I keep a couple of jars in my home refrigerator and “buckets” of confit at work. After the work is done (most of the time spent confiting, you can be doing other things) the confit can be quickly made into delicious and flavorful dishes. 1. Pulse the bay leaves, thyme, parsley stems, nutmeg and peppercorns in a food processor. 2. Spread the herb mix on the duck legs and refrigerate unwrapped overnight or for up to 2 days. 3. Wipe off the herbs and place the duck legs and garlic in a shallow casserole or Dutch oven. 5. Pour the fat over the duck legs. 6. Place the pan on a sheet pan and place in the oven. Cook for 3-4 hours or until the skin has begun to shrink away from the bone. The meat will look cooked through and the leg and thigh portion will be firm. 7. Cool the pan before trying to remove the duck. Gently remove the legs and place in a container for storage in the refrigerator (I use re-tasked cleaned and sterilized jars). Pour the fat through a strainer and directly into the jars to cover the legs. 8. Seal the cooled jars and store in the refrigerator for up to 6 months. *Confit jelly at the bottom of the jars—after the confit has been stored for several days, a dark jelly substance will gather at the bottom of the jars. This jelly is loaded with flavor and body and is the by-product of the confit process. Add the jelly to your soups and stews as a flavor base. 1. Arrange the salad on a beautiful platter. 2. Crisp the duck skin in a medium sauté pan and chop it up. Sprinkle over the salad. 1. Whisk the ingredients together and pour over the salad. I confit garlic in chicken fat all the time. It is my secret for creamy-flavorful mashed potatoes, soup bases and vinaigrettes. 1. Put all of the ingredients in a narrow pan so that the garlic can be covered by the fat. 2. Cook over very low heat for 30 minutes or until the garlic is soft. 3. Save the fat and use it for sautéing. Store the garlic in the refrigerator and squeeze cloves from their skin before using. Sign up for Chef Laura Frankel’s “Prepping for Passover” cooking class, set for Wednesday, March 6. Visit www.spertus.edu or call (312) 322 1773 to register. Spertus Institute for Jewish Learning and Leadership is a partner in serving the community, supported by the JUF/Jewish Federation of Metropolitan Chicago. 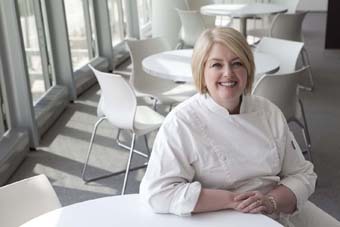 Laura Frankel is the executive chef at Wolfgang Puck Kosher Catering at the Spertus Institute for Jewish studies in Chicago.